There is a place in Mexico that is not on the north-west London tourist map – but it should be. 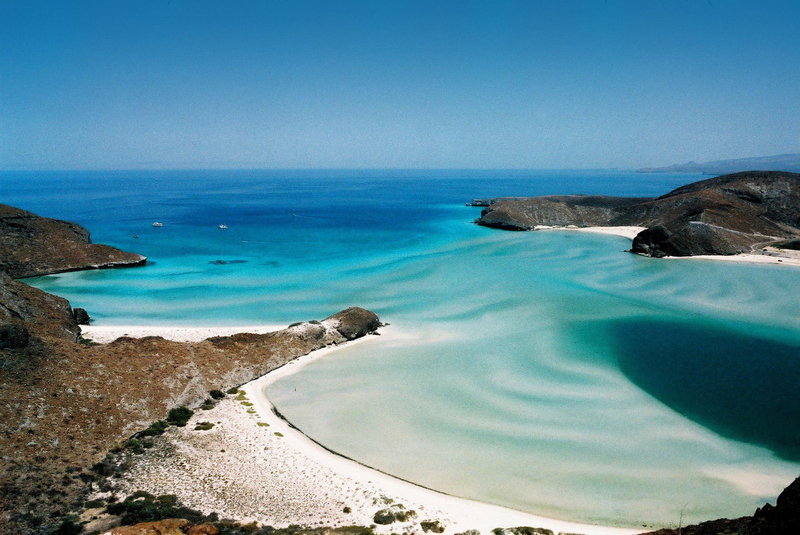 You are unlikely to see anyone you know in La Paz – as Cancun is where you will find them. 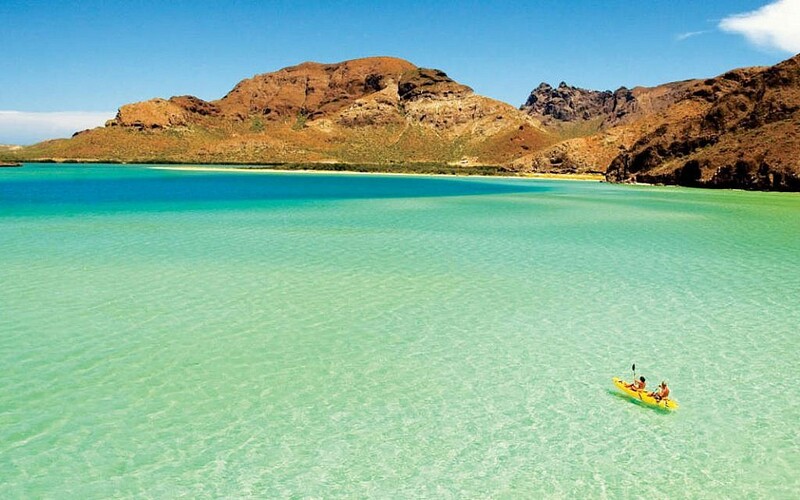 By contrast, La Paz is a glorious idyll that sits by the Sea of Cortez and it is the capital of Baja California Sur. Known for its seafront Malecón promenade, with beaches, parks and art by Mexican and international artists, it is an untouched beach town where you are more likely to meet sea lions and whale sharks than friends from Stanmore, but you can still dress up as if you are for a night out in the many bars and restaurants. 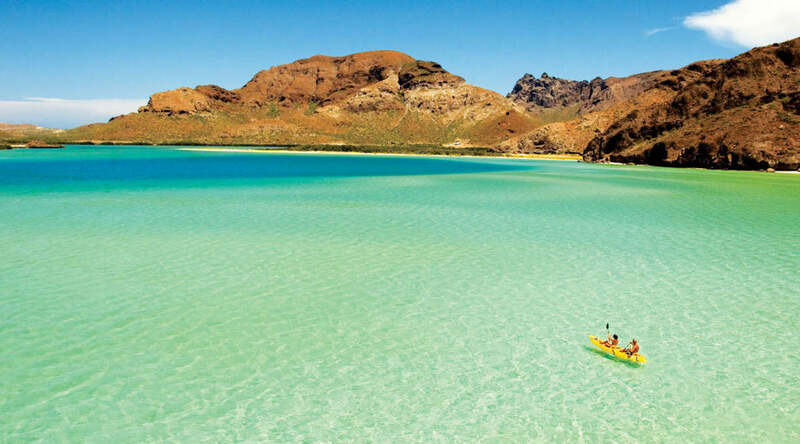 As a winter sun resort, it is hard to beat as it provides the best weather in a way that more heavily promoted destinations don’t, and it is worth noting La Paz is also warm from May to October and hits the high temperatures after that. Although there are a number of good hotels (La Posada and The Grand Plaza), as a destination with family, Playa de La Paz is the place to stay. A bespoke collection of 23 residences all facing the ocean, the luxury development has its own beach – so it is mega peaceful –and children are very welcome and safe. Playa de La Paz apartments are fully equipped with bespoke designed furniture and top of the line Viking appliances. All the rooms are spacious, super comfortable and tastefully decorated with king sized beds, flatscreen TVs and en suite bathrooms. The glass doors of the sunken lounges tuck back, bringing the outside in, so it is possible to sit on the sofa and sunbathe while watching the football. 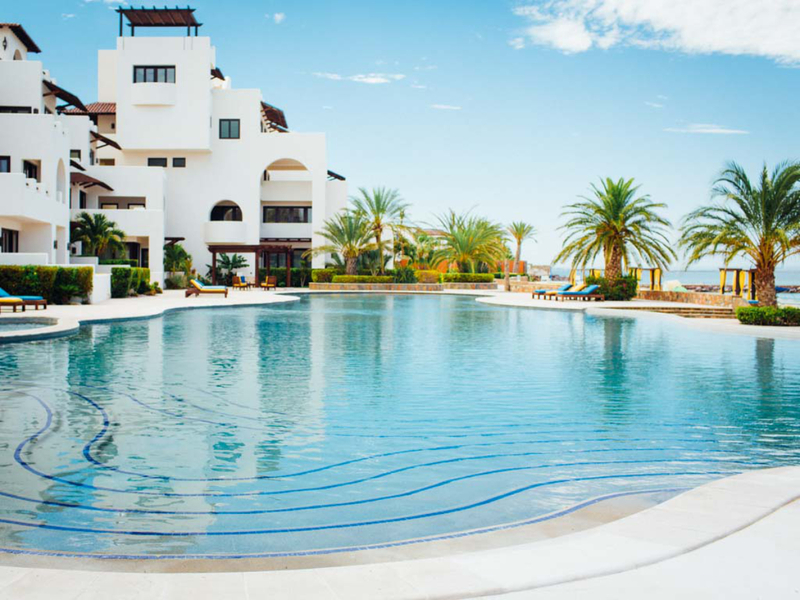 From the oceanside sun beds, to the Olympic sized swimming pool placed neatly by the sea, everything has been perfectly planned and landscaped for a guest’s comfort. There is even a yoga palapa (Spanish for ‘of the palm), which is an open-sided dwelling with a thatched roof. So you can “Om!” there. All residences include internet, Sky, a cable service in living rooms, daily cleaning service and security. There is also a 24/7 gym on site, and guests can use the kayaks and paddleboards. There are five residences available from 3,000 sqft to 7,500 sqft , so there is plenty of room for a large group and, for entertaining, a cook can be arranged in your apartment as they have a database of different chefs who specialise in vegetarian and can even offer kosher dishes. It’s not often that one is greeted by a Rabbi wearing a Mexican sombrero during Passover, but Rabbi Yosef Gutierrez likes to make an impression. As if finding a synagogue in La Paz isn’t enough of a surprise, the Beth Yona temple is beautiful and was built in 2012 by Daniel Berrebi in memory of his brother, Yona. The arrival of Beth Yona was of huge significance to the 150 Jewish citizens in La Paz, who, until then did not have a place of worship. 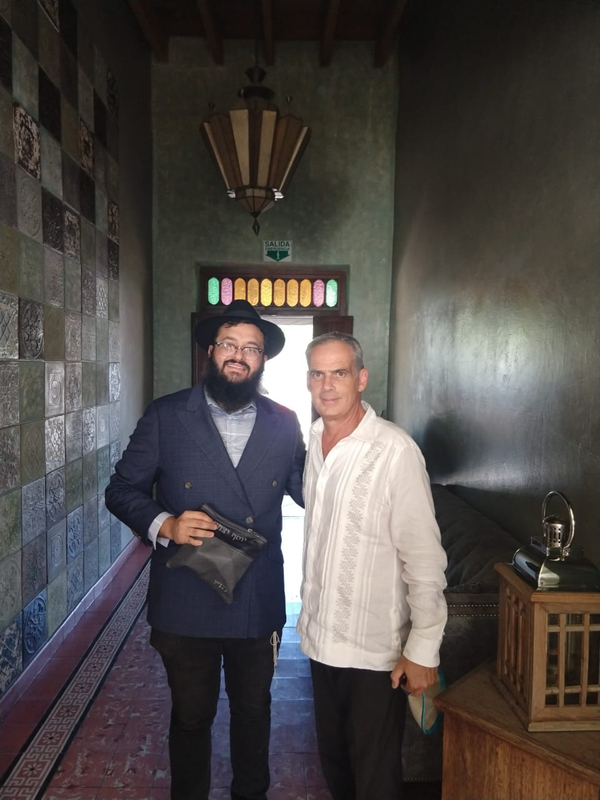 Rabbi Gutierrez’s mission is to make Judaism tangible for the local community, “as well as the non-Jewish brethren locally and those around the world and to increase acts of goodness and kindness in all communities”. Rabbi Yosef was born in Guadalajara, Mexico, but aged 15 went to Valley Torah Education and Yeshiva Habbat in LA. Time in New York working with the Jewish community was followed by a period of volunteer work in Israel, where he helped injured army soldiers in Hebron and completed his studies. The rabbi met his wife Rochel, a special needs teacher in New York, and they have a daughter, Gavriela. Returning to La Paz in 2016, Rabbi Yosef had the energy and enthusiasm required to build a community and his Kiddush is legendary. Expect a joyful and sincere welcome if you visit as we did, and enjoyed a Kiddush that was not compiled of moist crisps or flagging bread rolls, but a three-course meal set at a beautifully laid table prepared in the kitchen by the local residents under Rochel’s supervision. In order to ensure the kosher supply of food, shipments arrive from Mexico City and LA, but Rabbi Josef has secured a steady flow of chickens. The congregation were all invited and involved, including a miniature poodle belonging to a shul member! The shul offers services on High Holy Days, and has a mikveh, kosher food and overnight accommodation that consists of several one and two bedroom flats. For more information, visit: www.jewishlapaz.org, email rabbi@jewishlapaz.org or call +52 1 612 348 8808.